Everybody will agree a clogged toilet is extremely unpleasant. However, it is rather easy to unclog your toilet with a plunger. Usually, this device is effective enough to clear a clogged toilet. If this plan does not work to unclog your toilet, try hooking whatever is causing the blockage and pull it free – a wire hanger works well for this as we have learned in the plumbing business. Ensure there is enough water in the toilet bowl to cover the rubber suction cup of the plunger and start to plunge. If the bowl does not have enough water inside, DO NOT flush the toilet, as this will cause the water to push up into the bowl of the clogged toilet and possibly overflow. Instead, use a bucket to pour in the amount of water you require. 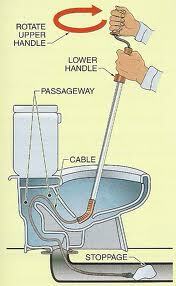 You can also use a plumbing auger (a long tube with a crank on the end that enables you to turn the hook in the drain). 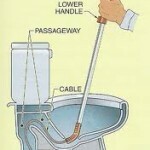 - Insert the auger into the clogged toilet and turn the crank until it feels secure and tight. - Pull gently on the auger and whatever was blocking the toilet, should come out with the auger. If not, try twisting the auger even more. In severe cases, where the plunger and auger delivers no result in unclogging your toilet, you might have to remove the toilet and turn it upside down to clear the blockage. This however is a job for qualified plumbers like us. Call us today to assist you with all your plumbing needs, we are 24 hour plumbers!